Inmarsat seems a plausible target despite U.S. peer EchoStar dropping its offer. The shares are down a third in a year, and on some estimates fail to reflect the value of the spectrum it controls. The former Permira buyout may appeal to private equity, or to satellite rivals. 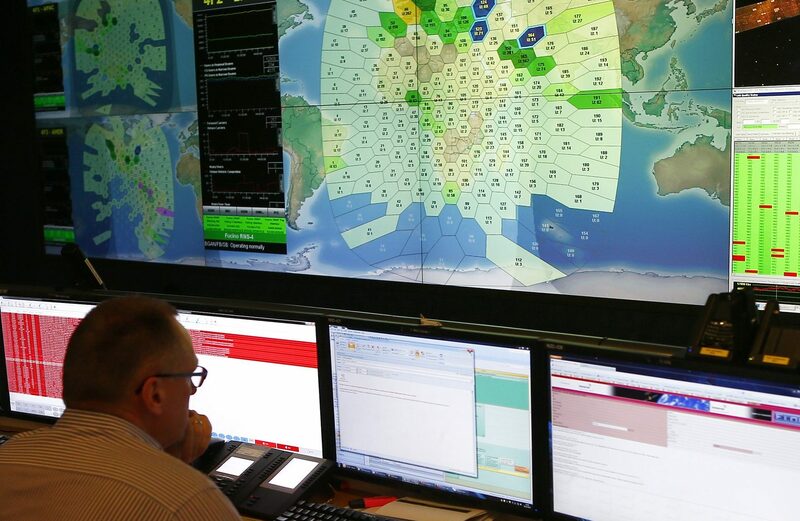 Staff at satellite communications company Inmarsat work in front of a screen showing subscribers using their service throughout the world, at their headquarters in London March 25, 2014. EchoStar said on July 6 that it had no intention to make an offer for UK satellite group Inmarsat. The U.S. group’s announcement came less than half an hour before a 1600 GMT deadline for EchoStar to either make a firm offer for Inmarsat or walk away. Under Takeover Panel rules, EchoStar now cannot revive its approach for six months, unless another suitor makes an offer for Inmarsat; the British company invites the U.S. firm back; or there is "a material change of circumstances". Earlier on July 6, EchoStar said its latest 2.45 billion pound ($3.24 billion) bid for Inmarsat had been rejected by the UK satellite group on July 4. That offer, which improved on an earlier price, consisted of 2.65 pounds in cash and 0.0777 new EchoStar shares for each Inmarsat share. Using the U.S. group’s July 5 closing price, and assuming an exchange rate of $1.324, it valued Inmarsat at 5.32 pounds per share. Inmarsat shares closed 8 percent lower on July 6 at 4.84 pounds. At 0750 GMT on July 9, they were up 2.4 percent to 4.95 pounds.